Although this room can fit adults, it has been designed with kids in mind. 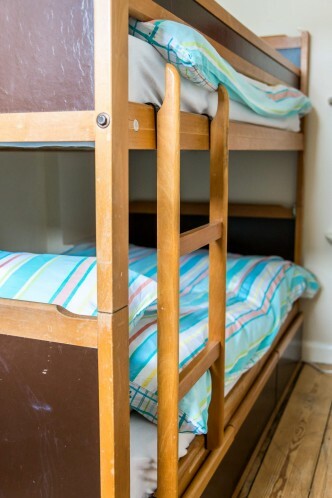 The drawers underneath the bunk beds are filled with lots of children’s books and toys, to save you the hassle of bringing your own. The rug has a street map on it, perfect for playing cars; and the light shade and hooks offer a talking point. This room is at the far end of the hall, right next door to the family bathroom. There is a high window, with a view over Beach Road; it opens at the top, to provide ventilation and to allow you to listen to the sound of the sea.